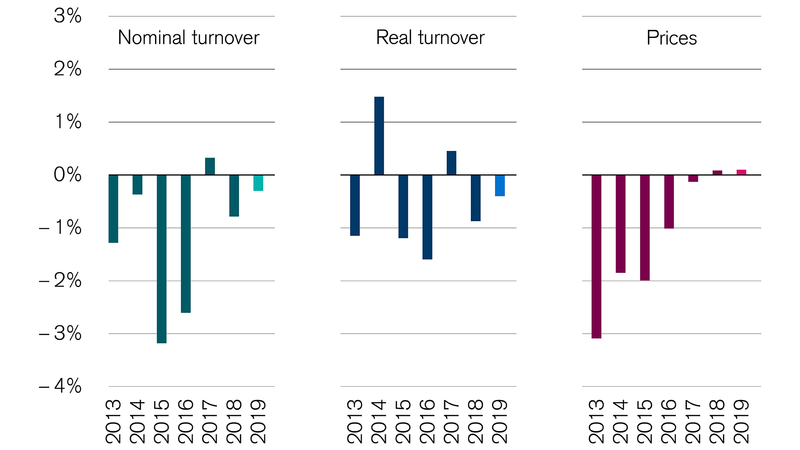 Sales revenue in the Swiss retail trade grew by around 0.4 percent in 2018, as shown in Credit Suisse's Retail Outlook. The sector was supported by a strong economy both in Switzerland and abroad. Still, consumer sentiment in 2018 was only slightly above the long-term average. This might be related to the negative headlines at home and in the international press. General inflation combined with relatively low wage growth also dampened people's desire to buy. For the second year in a row, Swiss consumers lost purchasing power. In contrast, the development of the exchange rate was positive for Swiss retail. In the first half of the year, the Swiss franc depreciated against the euro. Shopping abroad was therefore less attractive when compared to last year. This effect was strengthened by the fact that prices for consumer goods are rising faster in neighboring countries than in Switzerland. The price difference is still high, but it has come down slightly compared to its peak in 2015. The Retail Outlook is a collaborative study by Credit Suisse and consulting firm Fuhrer & Hotz. 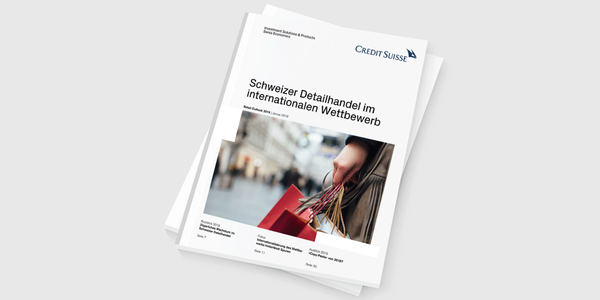 It provides an overview of Swiss retail trade. In this year's publication, the authors answer questions including those about the impact of Amazon's entry into the Swiss market and why Switzerland is not a discount country despite having Aldi and Lidl. Although shopping tourism in neighboring countries lost some of its appeal, the increase in foreign competition is clearly noticeable in Swiss retail. Today, every second retailer indicates that it has direct competitors from abroad. Ten years ago, it was one out of every three. On the one hand, the foreign competition that is physically present in Switzerland has grown. The market entries of Aldi and Lidl were influential in this. On the other hand, the competitive pressure on retailers abroad has grown in the wake of shopping tourism. Most recently, the competition from foreign online retailers has grown the most. The digitalization of retail trade erases national borders and increases the reach of foreign suppliers. The number of consumers who shop online across borders has risen significantly in recent years. No other segment of the economy has been so strongly captured by the digitalization of retail trade than the clothing sector. 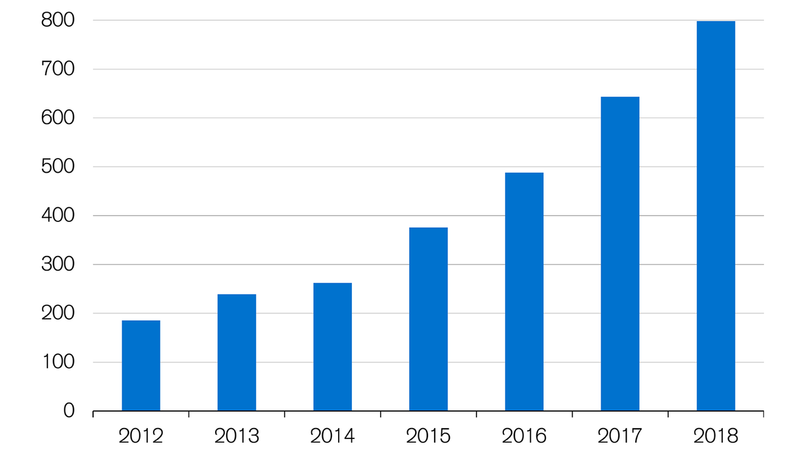 Zalando’s entry into the market in 2012 was dramatic to say the least. The economists at Credit Suisse estimate that the German retailer's sales in Switzerland came close to 800 million Swiss francs in 2018. That's almost one-tenth of the total sales of the clothing and footwear retail sector. We can assume that the competition will remain intense over the next few years. For example, Amazon's market entry in Switzerland hangs over Swiss retailers like the sword of Damocles. It is also completely unclear what the impact from the growing online competition from Asia will be. The retail trade is indeed facing challenging times. However, these challenges also bring opportunities. The intense international competition can be seen as a test of fitness, similar to what the export industry experienced. 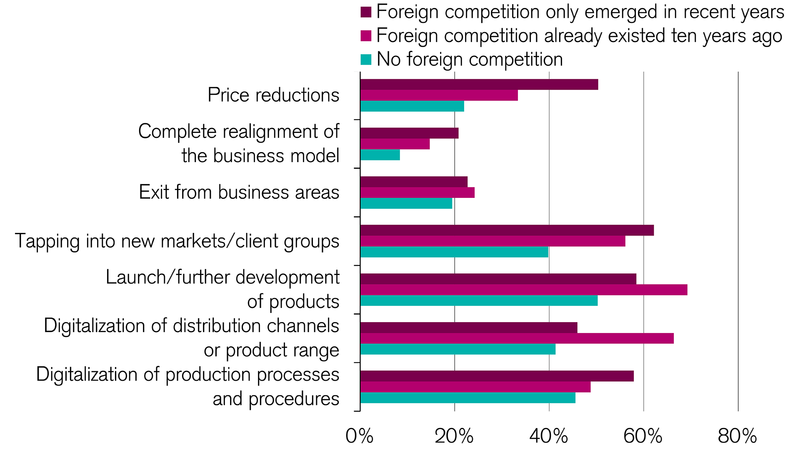 Credit Suisse's SME Survey already shows that retailers with foreign competitors have taken clear measures much more often to improve their competitiveness in recent years than those without international competitive pressure. Some of these measures include investment in new products, markets, and client groups as well as in digitalization. Therefore, the difficulties of recent years seem to have had a positive effect in spurring action and innovation by Swiss retailers. 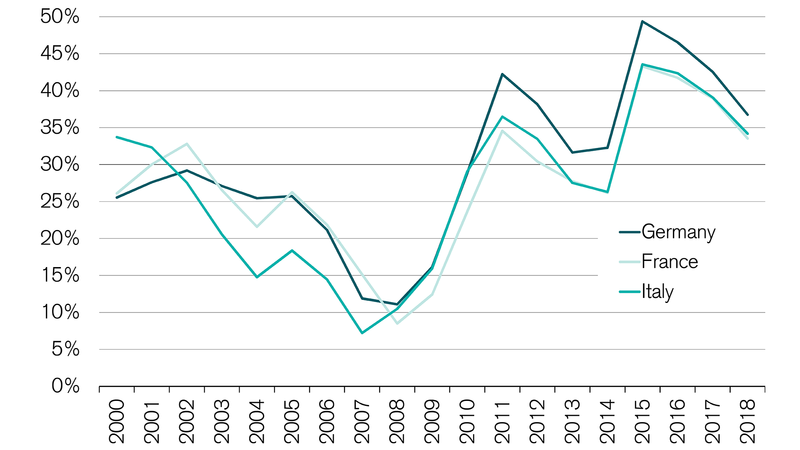 The Swiss retail trade should be supported by the economy in 2019 as well. At the same time, Credit Suisse economists estimate that purchasing power will increase for the first time in two years, thanks to faster-growing wages and slightly lower inflation. They therefore expect nominal revenue growth of 1.3 percent for the food/near-food segment. However, a decline in sales is expected again in the non-food segment in 2019, but the decline is likely to be significantly lower than that of 2018. 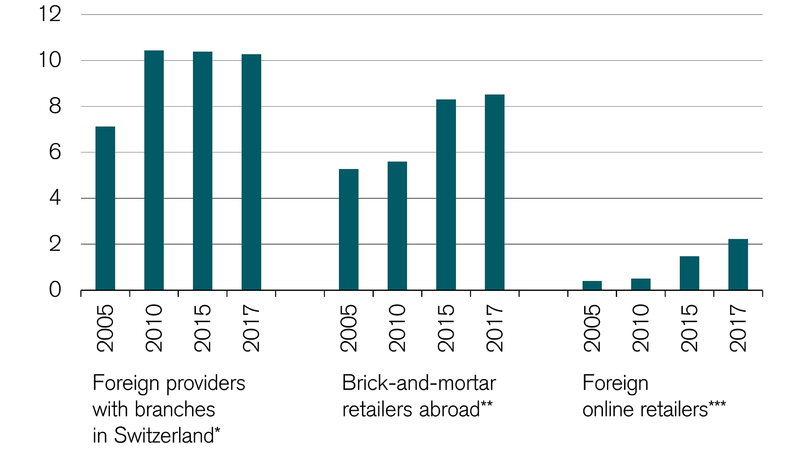 In particular, the outflow of purchasing power to foreign online retailers such as Zalando – and increasingly, Amazon – should continue. Overall, the Swiss retail trade will once again experience a weak sales growth of only 0.6 percent – despite a strong economic environment propping it up. Do you have questions about retail trade in Switzerland?